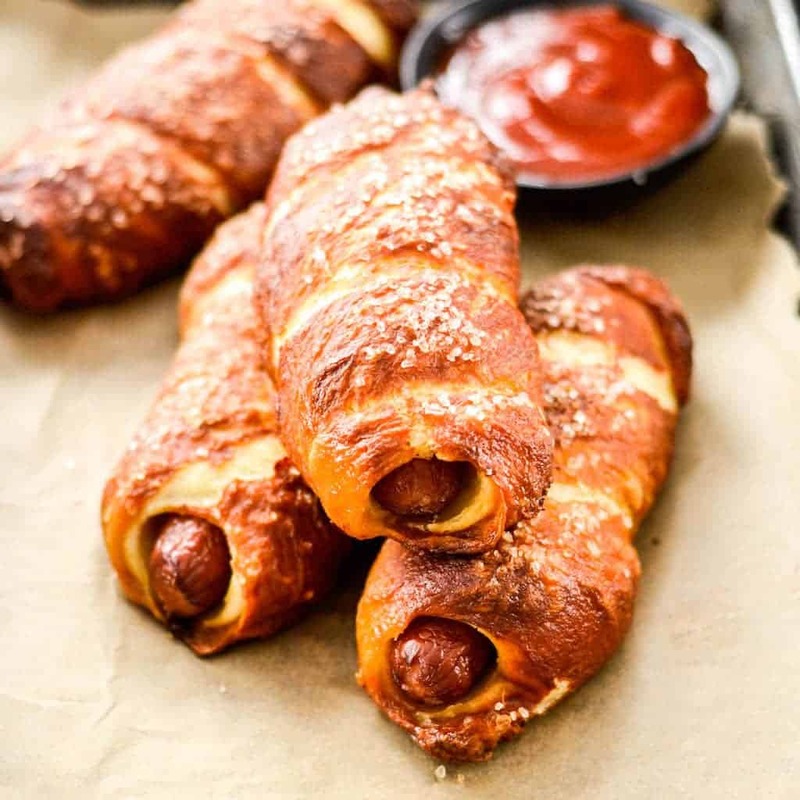 This homemade pretzel dogs recipe is truly the best! A from-scratch pretzel dough is wrapped around high-quality hot dogs making these a much better choice than store bought varieties! Plus they’re crazy delicious and freezer friendly! 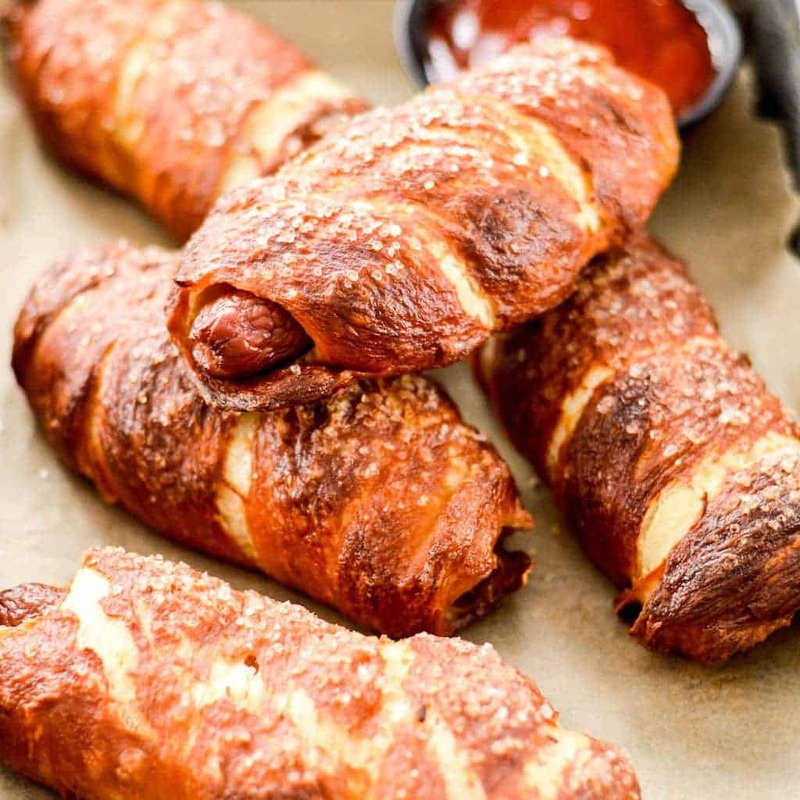 If you’re looking for a great appetizer or hand-held meal to enjoy while watching your favorite sporting event, then these homemade pretzel dogs are for you! 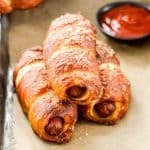 This Homemade Pretzel Dogs recipe combines two of my family’s favorite foods, my Homemade Pretzel Bread and hot dogs. 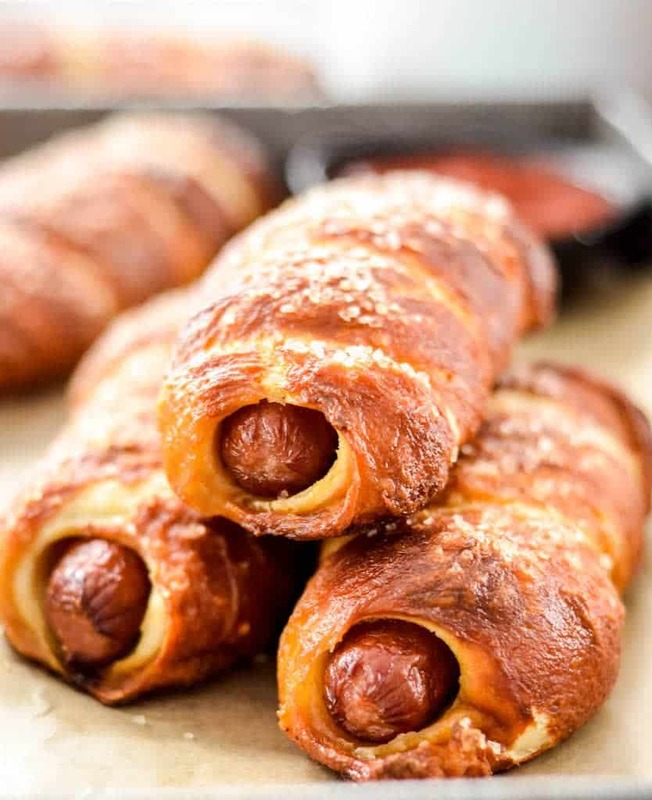 So lets jump into how to make these pretzel dogs! To see a full video on how to make the dough itself check out my homemade pretzel bread post! Really that might sound strange but not all hot dogs are created equal. Choose a brand and variety with a short ingredient list and one that is made with all beef! We always use Nathan’s! The best way to ensure that your Homemade Pretzel Dogs bake evenly is to wrap each one with exactly the same amount of dough. I don’t know about you, but I am terrible at eyeballing things. So, I pull out my food scale to get rid of the guesswork. Weigh the entire batch of dough and divide by 8. Then, to form your balls, add dough onto your scale until it reaches the correct amount. I find that the total weight of the dough ends up being around 800 g, and so each ball should weigh around 100g! Try to have everything set to go before you start wrapping and boiling your Homemade Pretzel Dogs. I grease my pans, and have the salt ready and baking soda bath boiling before I start wrapping. After the hot dog is wrapped, immediately drop it into the bath and boil for 60 seconds on each side. Transfer it to the greased baking dish and get ready to bake. I usually bake these on two different baking pans so I can put the first four in the oven while I’m wrapping/boiling the last four. This ensures that they don’t rise too much during the waiting time. Homemade Pretzel Dogs! A MANtastic recipe for all your sports watching needs! A from-scratch dough is wrapped around high-quality hot dogs making these a much better choice than store bought varieties! Plus they're out of this world delicious and freezer friendly! Combine yeast, water, and brown sugar in the bowl of your standing mixer fitted with the dough hook. Let stand for 5 minutes (until foamy). While yeast is proofing…melt butter in a microwave-safe bowl. Mix in milk and set aside. Once yeast is proofed, add milk/butter to yeast mixture and mix on low speed with dough hook until just combined. Add salt and flour and mix with dough hook until flour is fully incorporated. Knead in your mixer on high speed until the dough forms a slightly tacky, but firm ball, you may need to add a little more flour 1 TBS at a time, but be careful, you want your dough a little tacky but not too sticky to handle. Oil a large bowl, place the dough ball in the bowl, and cover with a damp towel in a warm place to let rise for one hour or until doubled in size. Preheat oven to 400 degrees F and bring the 4 quarts of water to a boil. When the water is boiling, slowly add the baking soda (Be careful or you will have a baking soda/water explosion)! Remove the dough from the bowl and gently press out the air bubbles. Make 8 balls of dough the same size (NOTE: The total weight of the dough comes out to be about 800 g, so each ball should weigh about 100 g). Take one dough ball and roll it into a thin rope, 8-10” long. Wrap it around one hot dog making sure the ends are secure. Repeat this with all 8 hot dogs. Gently place two dough-wrapped hot dogs into the boiling baking soda water. Boil for 60-90 seconds on each side, turning it once to guarantee both sides covered. Drain the excess water and place them on an oiled baking sheet. Immediately sprinkle coarse sea salt over the dough to your specific tastes. Repeat with the other 6 hot dogs. (Do not let it rise at all here! Straight from boiling into the oven). 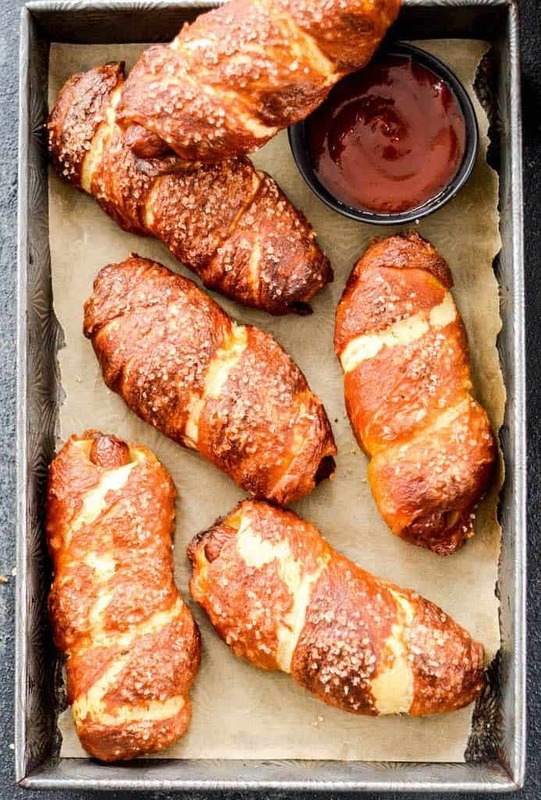 Cook the Pretzel Dogs for 22-25 minutes, rotating the baking sheet once. Pretzel dogs are done when they are deep brown! Once removed from the oven, immediately brush the melted butter over the Pretzel Dogs to guarantee a soft crust. Serve with your favorite condiments and enjoy! 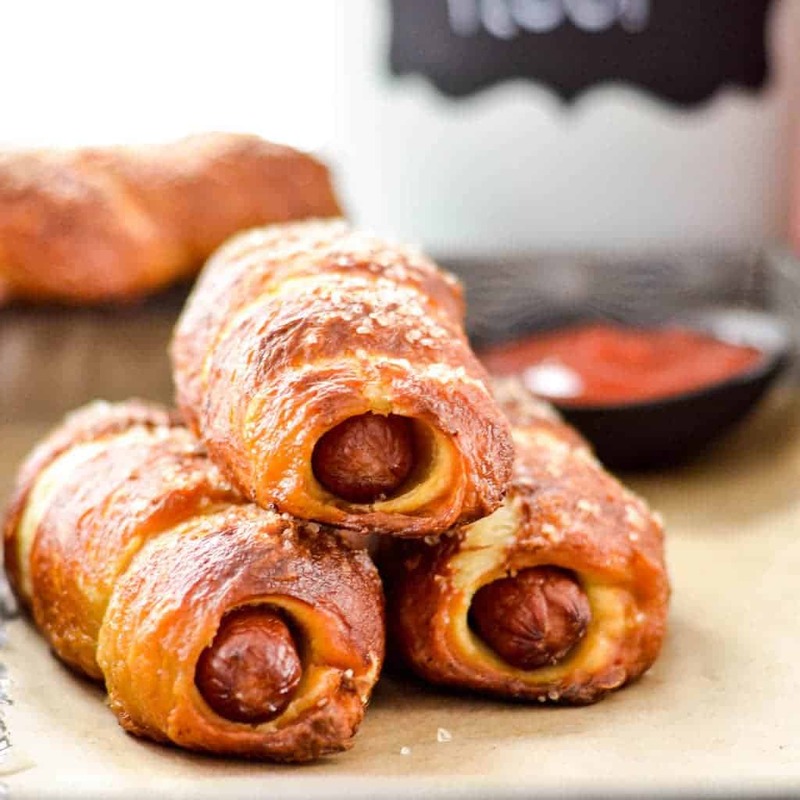 I’m glad I get to share this Homemade Pretzel Dogs recipe with you because sometimes you just need to make food FUN! I won’t buy highly processed, pre-made, frozen dough-wrapped dogs, because they have so many things in them that I don’t want to feed my family. Question: What’s your favorite food to eat while watching Football? How do you feel about hot dogs? 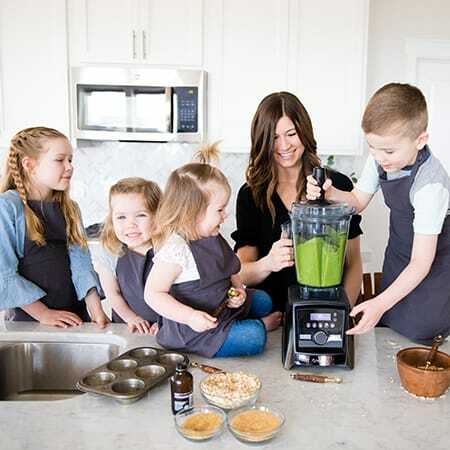 This is super sweet. I love that your husband will eat anything, and that you love to serve him things that he really loves to eat. These look like the perfect perfect food. I love corn dogs,(did I just say that? ), and these look like a step up from those (a HUGE step). LOL YES these are a tad better than corn dogs!